I'm thinking this is the MOBA for me. 15 minute matches... THANK YOU! Most MOBAs are just too freaking long! I've been at loss for a go to multiplayer game since Super Monday Night Combat drop which had similar game time. Short matches + de-emphasizing last-hit mechanics = VERY high likelihood I may actually enjoy this. These "side-projects" like Hearthstone and Heroes of the Storm are the kind of gaming I've missed from Blizzard. Very happy to see them coming back to their roots in a sense. I think with the company hitting 20 years old recently, they've done a fair bit of navel gazing lately (I have a feeling the Activision-Blizzard split from Vivendi isn't hurting either) which is why they pushed hard on the nostalgia at BlizzCon this year. It doesn't hurt that DotA-style games are all the rage right now, and digital CCGs are the up and coming new hotness. I would still like something new as far as IPs go but I also like seeing them giving new types of games a go as well. If there's anything Blizzard does right, it's analyzing current trends, making them accessible to a mass audience, and polishing the experience a ridiculous amount. I know this stands to be my first serious attempt at trying a DotA-style game. I bounced off Uber's SMNC and while DotA 2 and LoL have been intriguing I just haven't really found myself interested enough in learning the game and dealing with their communities. I recently got into dota 2. The only reason I was able to do that was because I have some friends who regularly play and I don't know how anybody would be able to get into those games without having someone hold your hand and walk you through what is going on. Even with that I just now feel like I am getting the hang of it and that is 80 hours in. If Blizzard can take the same deep, competitive, and fun gameplay while making it more accessible and the matches shorter they can have a real winner on their hands. This, basically. I gave DOTA 2 about 20 hours of practice against the AI, and while I liked a lot of things about it, last-hitting was just such a stupid mechanic that it put me off of the whole game. I look forward to playing this new HotS in 2017. Ha! I heard beta is early 2014 so I wouldn't worry too much. The only deal breaker I can see if they charge for heroes like LoL. So apparently this is in technical alpha. Here is some basic gameplay footage. Looks pretty good. I have been thinking that this is what we are getting instead of pvp in Diablo 3 and I am totally okay with that. I mean I can't imagine d3 pvp being much different from a moba anyways. Plus you will have less headaches trying to "balance" (read: narrow as much as possible the discrepancy of) the insane variety of numbers on gear, levels, skills and runes. That's part of why I like Smite, they are shorter (though still can hit 30-40 in long ones) and they reward even if you don't last hit. Plus I like the shooter feel of the camera view. Hoping to get to try this one soon. I played Sins of a Dark Age beta, then I was reminded why I was excited about HotS. Hurry up beta!!!! The CE for Reaper of Souls comes with a HotS character unlock, so I imagine the beta must be coming soon. This game looks awesome and just the thing that a guy who loves real-time strategy but who is just too old and slow to micro dozens of units is looking for. I'm guessing if you can handle Diablo 3 you can at least be decent at this game. I also appreciate you don't need to learn a completely new system that's incredibly hard to master like DOTA 2. Pre-Alpha invites are already out in the wild. I know it's alpha but I can't say I'm too impressed from watching it. Maybe that will change once I actually play it and things improve in the upcoming beta. I am excited about the 15-30 min MOBA matches though. This game looks awesome and just the thing that a guy who loves real-time strategy but who is just too old and slow to micro dozens of units is looking for. This is the first thing ever written about a MOBA that has made me interested in trying the genre. I'm not ok with that. They broke their promise to their customers on D3 regarding PvP. As a for this moba though it does look fun. D3 has the dueling arena, what other promises did they make? I played in a 4v4 D3 arena at BlizzCon 2010. I believe that is the mode he's referring to. Ah ok, I'd totally forgotten about that. Personally I don't think D3 is a good place for PvP. The design of the game is not one that lends itself to PvP, just like it wasn't in D2 or D1. 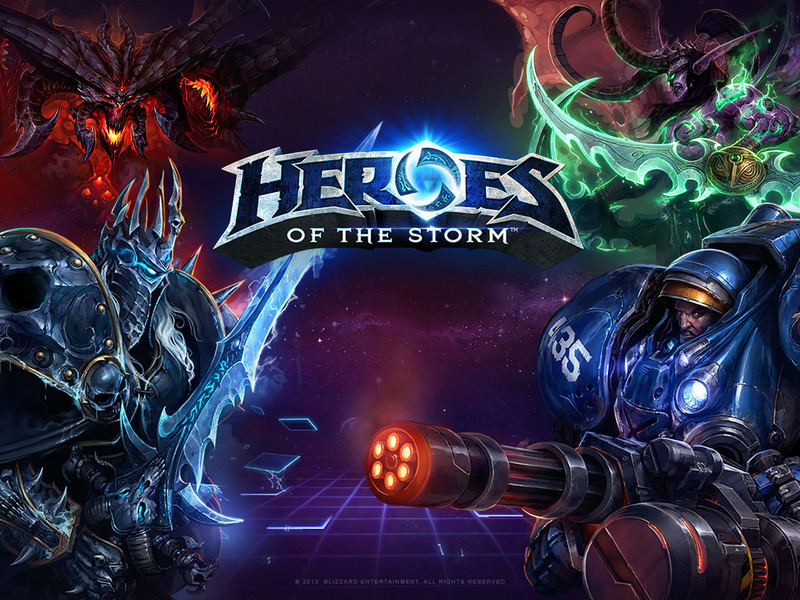 I'd rather Blizzard focused on something like HotS for PvP, where they can make that the focus of the game and really polish it. I'm eagerly awaiting being able to play this. I hope that my Reaper of Souls CE will get me higher priority into the beta. I dunno, has the dance studio appeared in WoW? I forgot to opt in! Good thing you mention in. I doubt I'll see anything soon. I'm a little disappointed to hear that they are charging for heroes. I was really hoping they would go the DOTA 2 route. Probably better discussion in the D3 thread, but I absolutely loved it in D2. When I wasn't doing gear runs it was a lot of fun. Does it have ways to unlock the heroes for free by playing or in game currency? A friend told me there's only one current, but you can get it both by playing and by spending. Plus I think we have already seen that heroes/skins will be awarded through cross promotions with Blizzcon and their other games. I am sure that will continue. I was just hoping that if you like a character, that you can play it enough while it is in rotation to unlock it before it goes out of rotation. It's basically Hearthstone, you get gold either by paying $$$ for it, or by completing daily quests. So you do not have to pay a cent if you don't want to. I prefer not to grind many hours to get the heroes. I'm still ok with it since it's free. It probably won't matter if the game is fun anyways. On the bright side I saw you can try any character at anytime on some kind of test run. I'll take that too.